A beautiful small apartment that is chic with many special features in it. Space is never a hindrance to get a beautiful home because we have seen many spaces that has limited floor area but still managed to get a functional, comfortable and beautiful home from it. Yes, with a designer’s creativity, nothing can hinder to get a nicely designed home. That is why tiny homes are a trend these days because of this but aside from actual homes that are built from scratch, renovations of small spaces like apartments can also work well. As a matter of fact, we have featured areas like this on Home Design Lover many times already and each space never fails to impress us especially those that use transforming furniture and use every area in a smart manner. Today, we are going to show you another beautiful small apartment that will give you ideas if you own one and is planning to renovate it. 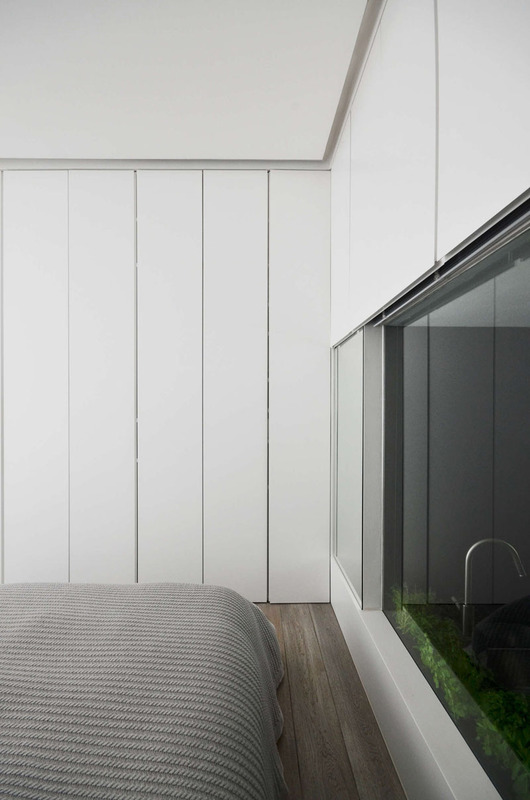 Daniele Petteno Architecture Workshop designed the apartment which they called the Never Square Apartment. It is located in the centre of London with a 69 square meters area. 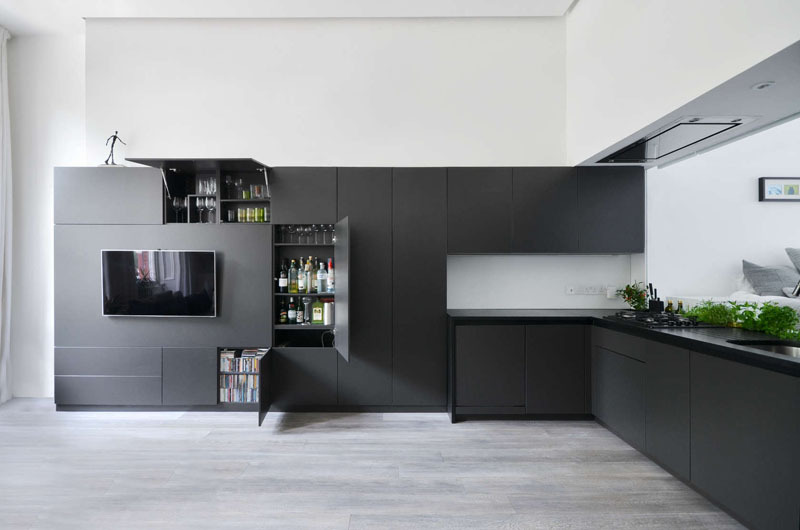 It is an unmodernised apartment at the raised ground floor of an 1880’s monumental residential building which was turned into a practical and beautiful home for a young family, with the highest living standards and plenty of innovative design solutions. 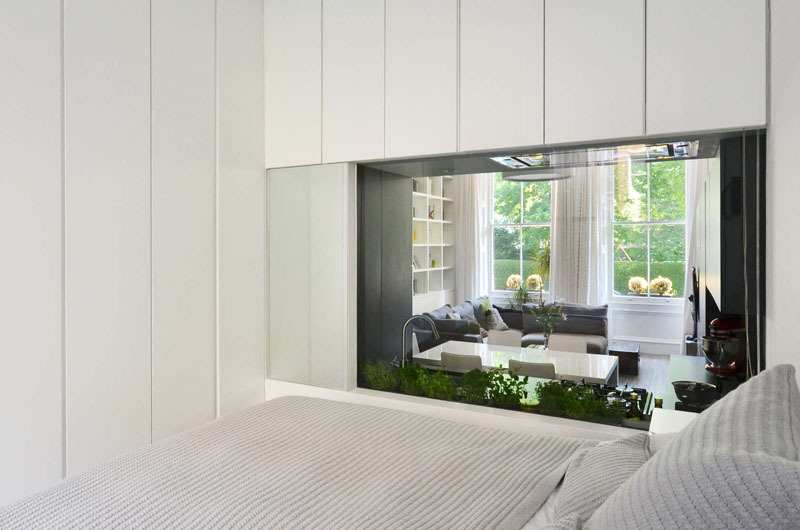 The apartment used highly optimized and bespoke design which made it possible to organize in a depth of only 10.85m. It features a tidy and fluent linear sequence that included a Living-Dining-Kitchen-Master Bedroom-Studio area and an overall 11 dedicated areas/rooms. Let us take a look at the images of the apartment below. Unique feature: A chic apartment redesign which turned out very beautiful with a modern minimalist approach. It has a fluent linear sequence in the interior to ensure good flow of traffic inside the house. The apartment has a mostly monochrome palette with pops of color added to the decor. 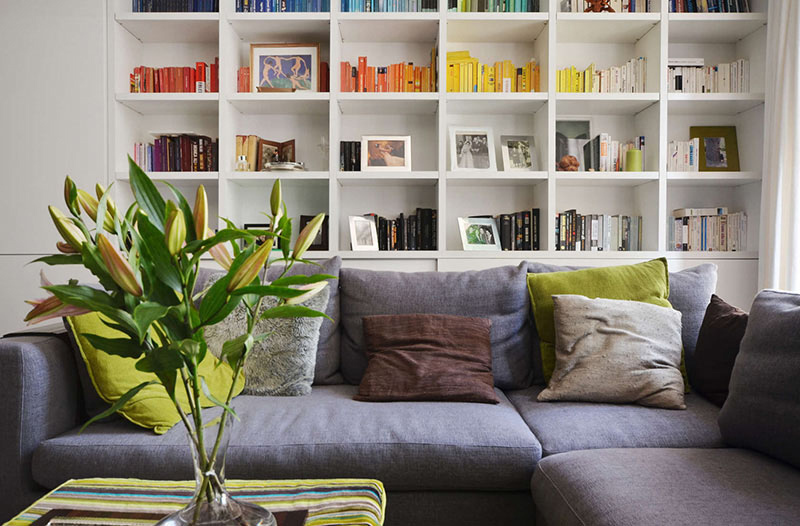 In the living room, it has a green coffee table and pillows, as well as books that were color-organized. Because of that, the books become an additional decor to the house. Aside from the books, there is also a plant that is added on the coffee table in the living area. No doubt, this added a more refreshing appeal to the space. The house has contrasting elements in it from its usage of materials and colors. You can see here the kitchen and dining area as well as the living area that we have featured in the above images. You can also see the window in the living area which brings natural light to the home. This is the kitchen of the house that has many storage areas and a television installed on it. Due to the apartment being very linear, the kitchen cabinets wrap around the wall to become the entertainment center. To save space and to make sure that it will have more functions, storage spaces were added to it. Another look at the kitchen where we can see its modern kitchen stove and its neat countertop. 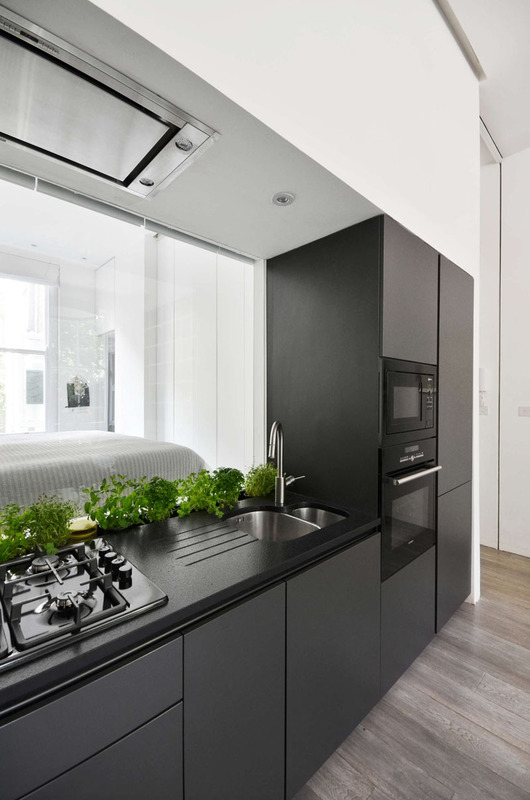 And this is indeed something that we don’t see too often because in the kitchen, they’ve included a glass window backsplash behind the sink that provides a view through to the bedroom. And yes, you can see plants there as well. This feature is not just interesting but it is also practical since it allows natural light from the windows on either end of the apartment to flow through to the middle of the interior. Aside from that, it also makes the overall space feel larger. This is the view from the bedroom to the kitchen/living area through the window. There’s also a screen that can cover the window when you don’t want others to see your bedroom because of course, we need some privacy from time to time. And since this bedroom can be seen in other areas of the house, it is obvious that the owners need to keep it clean all the time. You don’t want guest to be looking at a messy bedroom. The bed has been raised up to separate it from the desk area below. This bedroom isn’t only meant for resting and sleeping but it also has a working area too with a wooden desk and a chair. The apartment also features thoughtfully designed custom-cabinetry which can be seen throughout the apartment just like this one that can see just before entering the bedroom. 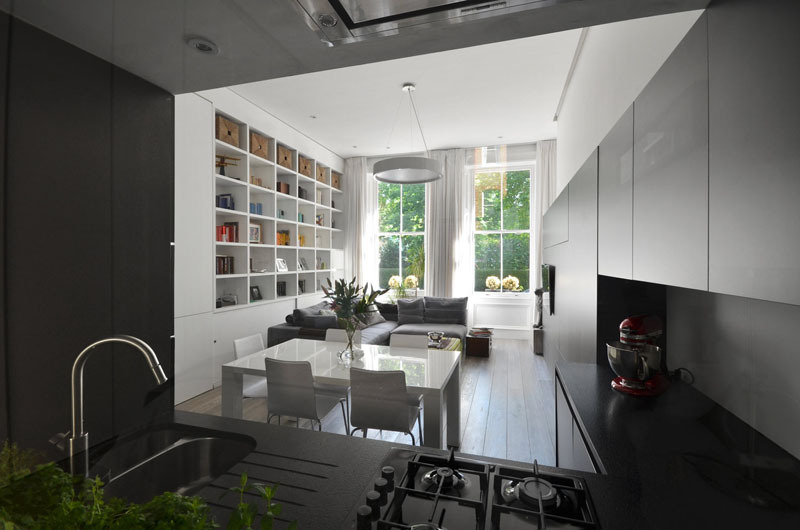 Since the apartment is small, it is kept clean and neat with the different storage areas in it. Seen here is the black and white bathroom that is thin but long. It has a shower head positioned directly opposite the vanity and sink. Even if it is small, it has everything that one needs for a bathroom. It does look simple, right? But we will surely agree that this apartment looks very nice. 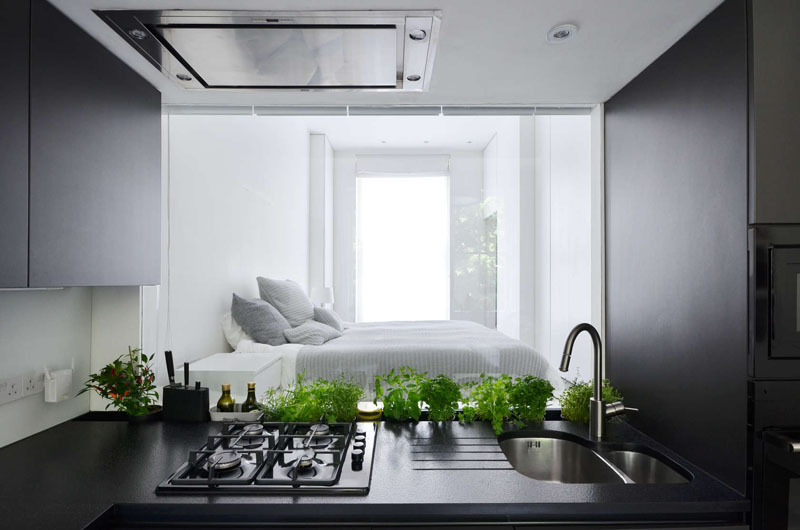 One feature that I like most is the window between the bedroom and the kitchen with a small garden on it. Also, you can notice the lovely contrast of colors in it. I also like the way the layout was done and how it was decorated. 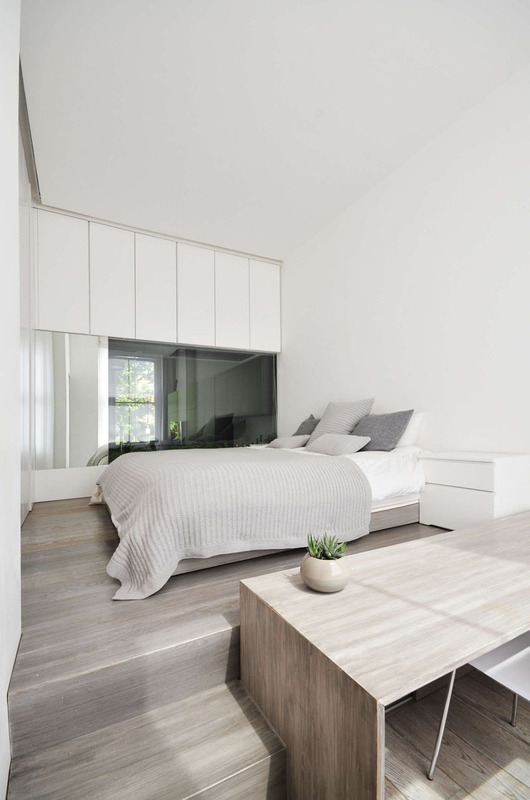 This apartment designed by Daniele Petteno Architecture Workshop looks very beautiful indeed and for sure, you would love to live in a space like this that doesn’t have too much but has everything! How about you, what can you say about this apartment?